How would you like to drink #BeerforGood? 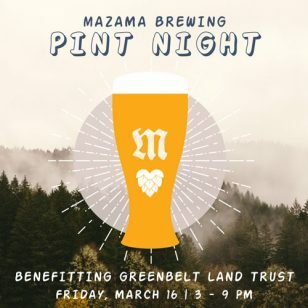 Mazama Brewing’s Pint Night will benefit Greenbelt Land Trust on Friday, March 16. For each beer purchased, $1 will go to Greenbelt’s work to conserve our community’s natural areas, water, and wildlife. So bring your friends and enjoy delicious beer at Mazama’s Taproom. It’s great beer for a great cause! THANK YOU to our friends at Mazama Brewing for their support. Cheers!